We love Braciole Italian Stuffed Meat Rolls. It's always a treat to get that on Traditional Sunday morning dinner in an Italian household. Braciole is a stuffed roll with herbs, spices, bread crumbs, garlic. Through the years I have grown fond of using thinly sliced pork over beef. It makes a great rich flavor for your Sunday Sauce. After you roll it up, to keep it together you can either use toothpicks or chef string to hold them together. I always worry about using the toothpicks, so after frying them seam down and they are sealed completely I take out the toothpicks before adding them to the sauce if using. I also like to simmer them in their own pan seam down so they don't open up. That has been successful when I don't want to worry about the stuffing getting into my whole pot of sauce if there is an anomaly of some kind. I can still remember mom making these on Sunday morning and the smell of garlic in the oil frying before she started to saute them. The outside of the meat was always deliciously seasoned. 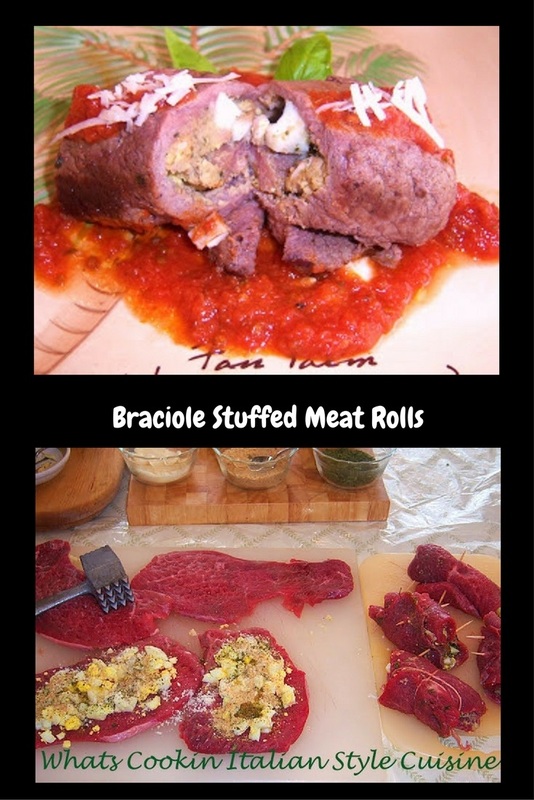 Braciole is a stuffed meat roll using with beef or pork. It is stuffed with herbs, egg and bread crumbs. Always a treat when mom made this, usually around the holiday. 4 tablespoons extra virgin or regular olive oil..... and canola oil for frying. Pound steak into thin 4 x 6 inch pieces. Put slices between waxed paper and whack it with the back of a sauté pan or meat pounder. Roll up each slice after filling, about 2 to 3 tablespoons of egg filling and tie with string or secure with toothpicks. Heat a large sauté pan over high heat and add 1/4 inch of oil. When oil is heated add 3 whole cloves of garlic and the meat rolls seam side down Lower the heat, brown them on both sides, remove from pan when brown and held together. Remove garlic if it starts to turn too brown. MAMMA MIA I CAN'T TAKE IT...MY MOUTH HAS BEEN WATERING SO MUCH....IT'S RUN DRY!!! Oh my goodness that is one mouth watering meat roll..delicious!! !